Interests - Postman Pat (huge fan), Fireman Sam, Peppa Pig, Balamory, Handy Manny, Fifi, Dora the Explorer, Disney Princess and anything Disney, anything about mermaids, Minnie Mouse (her favourite! ), Daisy Duck, music, crafting, sewing, games, puzzles, paint by numbers, mosaic stickers, notebooks, loom bands, loves all things pink, handbags and hats, collects nail varnishes. Visually/hearing impaired? - Yes - Poppy is now profoundly deaf. Poppy is a loving, smiling, happy little girl. She was born at 28 weeks and from birth she had inflammation of her bowel and started treatment for it at 3 months old. She was initially ng tube fed, then nj tube fed by 6 months, and her first operation was at 9 months old when she weighed just 8lb. Over time, more and more things became apparent with Poppy. She had pseudo obstruction from 7 months old, hypoglycaemia caused by a rare condition called growth hormone resistance, and poppy has delayed gross motor skills and couldn’t sit until 18 months and didn’t walk until 2 and half years old. She used a walking frame and has special boots and orthotics. She also has Ehlers-Danlos Syndrome too. Poppy has been tpn dependant since January 2010 and has suffered many line sepsis since November 2009, with 4 bouts of pneumonia, cellulitis, and with multiple bugs in her blood stream at one time. Her inflammation has got much worse along with the pseudo, and on many occasions we have nearly lost Poppy as she has been so ill. Somehow her little body fought hard and she is still battling on and always with a smile! Poppy’s intestines are really struggling this past year and even though she’s on TPN she’s still not gaining weight or growing. She has a MRI booked for the 26th July 2010 of her bowel. In May she was put forward for small bowel transplant, but she is not a candidate as yet, so her battle continues and we can carry on giving her the best life we can when we’re not in hospital. Well, what a year we have had. As you know, Poppy got her transplant call in September and she had a really rocky time. What with her abdomen being open and huge infection problems, gvhd and rejection, collapsed lungs and every complication possible, it was very tough. However, Poppy’s finally turning that corner. She’s still needing iv fluid at night… but she’s off tpn and she is able to eat if she likes, but she gets her calories via her ng tube. Poppy’s open abdomen wound is getting there and we are hoping it will close within the next month. She’s almost 7 months post transplant so it’s been a long road for her with her wound and it’s been pretty difficult at times, so it will be amazing for her once healed. We also found the day of transplant that Poppy’s genetics came back as a defect gene, so we at least have some answers. At the moment Poppy has a ileostomy stoma and a colostomy stoma too. In May, Poppy will have more surgery to close her ileostomy and her new colostomy bag will finally be in use. Our team are hoping that by doing this now Poppy’s colon will be less inflamed and cause less issues for her – it’s a right pain at the moment for her! They may revise her scar as it’s huge and possibly close her stomach muscles too… or this maybe done with the next surgery when they close the colostomy and reconnect her new colon. So there is a lot more surgery planned for poor Pops but she’s a little star and I’m sure she will bounce back! 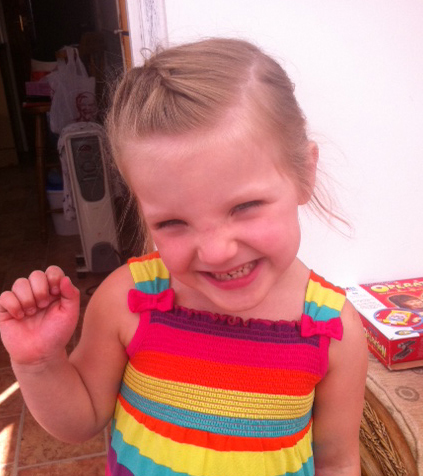 Next month Poppy is seeing the cochlear implant team, as last year she became severe/profoundly deaf. It’s been really difficult all round and we are learning sign language, but she’s been assessed at Great Ormond Street for cochlear implant surgery, so possibly more surgery on the cards. Poppy’s rejoined her class in school after nearly 3 years out of school, it’s just a few hours but it’s enough for her right now. She hates going but once there she seems happy. Lots has changed for Poppy but mostly for the good. It was really tough in the years and months before transplant, and we honestly never thought she would make it through. Transplant has been a real journey, and by no means a cure, but whatever time we get we will live to the max… enjoying and making memories as much as possible. I feel now is the right time to move the girls on from Post Pals. It’s been lovely and you guys are amazing, but I feel lots of children are more deserving right now. I’m sure in the future when Poppy needs re transplant we will be back as they only give you 3 or 4 years maximum with these organs, but for now we are doing well. Thank you so much for all your help, post and smiles over the years. It’s been amazing and has made long stays in hospital so much more bearable for the girls, as you never forget Coral either. Thank you to everyone who has sent us post over the years, it really has been appreciated and helped us so much. You can keep up to date with us on Poppy’s Facebook if you like ‘Poppy our fighter’. We intend to have lots of fun to share on there! I have one more ask of you all… please think about organ donation, sign up, discuss it. Poppy is more than proof it’s worth it… if you have followed Poppy you will know her journey to here. Organ donation saves lives. Pops is doing amazing! This super princess has definitely cracked it this time… go Pops! It’s about time… we are in our 10th week on picu/hdu. Maybe this week we might make the ward if we can get her bp more stable! Blood pressure is still being a pain, so she is still hooked up to infusion. The obstruction keeps causing pain but hopefully they’ll have a look with a camera this week and make a plan. Lots of resistant bugs as usual too so back to full gowning up for anyone visiting our room. Arrrgghh pesky bugs! She is looking much better though – such a difference in just a few days. She is eating skips and sipping juice which is amazing as she has never eaten in her life! Keep it up Pops! 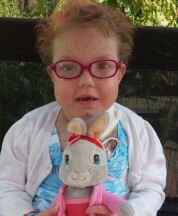 Poppy had her transplant on 5th September (5 organs). Shes had a rocky time and still hasn’t left itu/hdu in the whole 9 weeks. She’s had lots of problems with the same infection bugs from before transplant and they are now in her open wound so has had a lot of sepsis. She had a 2 week period where we didn’t know what was wrong, 2 solid weeks of a high temp which wouldn’t come down and her needing bipap. She also had an awful rash and after a skin biopsy it showed Poppy has GVHD. This is where her donor cells within the new organs were attacking her tissues/organs making her very unwell. She has responded well to treatment so far but until she comes off the treatment we won’t know if it will return as it hasn’t fully gone from her skin yet. Her open abdomen is getting a little better but she has had problems with it going necrotic due to an underlying condition of connective tissue meaning that she doesn’t heal well. Poor thing. Poppy has taken all this in her stride and has coped so well, but she’s really missing home now. We all are. Coral is at home and we are over a 500 mile round trip for a visit so it’s really tough all round. Pops is a fighter so we will get there… just got to keep the hope. Day 8! Pops is finally off the oxygen!! Just need everything else to improve! Come on Pops! Pops is the same really, no change. Blood pressure is still being a nightmare. Added in yet another infusion (9 pumps running!) so still in HDU and will be for a while yet. No feed this week now as the gut is not coping yet and the pain is still bad from her open abdomen, bless here She’s a little star!! Pops is in HDU now. Her blood pressure will keep us here a long time as she’s on lots of drugs/infusions for it and it’s still not good. We knew this would be an issue as it’s one of her biggest problems. GOSH are helping with advice. Her pain is really bad due to the open abdomen, bless her. The pain team are amazing as always and trying their best. The biggest most amazing thing ever is we are running 5mls per hour dioralyte into her new bowel, bypassing the new stomach…WOW!! Keep praying as it is just day by day… hour by hour… she’s a little star!! Pops is off the ventilator, on oxygen and still in ITU. Her blood pressure is still an issue and hard to manage but they are chucking everything at it, she always has issues with it so we expected this. She’s doing well and stable… all the expected problems but she’s fighting. The pain is awful for her as she’s still open and will be for a few weeks. Such a brave girl. Pops is out of surgery. She had some complications but she’s doing ok. Now her journey of recovery starts so please keep praying. The surgery was just 8 and a half hours! I love our surgeons, they looked after my baby. Sadly they couldn’t close her abdomen though so she will still need more surgery in a few weeks. Poppy got her call at 6am. Two ambulances and a helicopter later we arrived. It’s been a long hard day. Poppy is in theatre now (9pm) and it is the start of her new life. Thinking of our donor family tonight with so much love for the life they’ve given. My baby is so brave… please keep praying. I’m so sorry I’ve not update for a long while. Poppy has been in and out of ITU and ventilated a few times too this year, the poor girl is having a rough time. Her transplant listing has now changed and sadly includes a liver too, so she is now on the list for 5 organs (full multivisceral-liver, small bowel, large bowel, stomach and pancreas). She has been 10 months active on the transplant list now! She is still having ongoing infections and pancreatitis pain, so is on a lot of morphine and a huge dose for her patch. Since the increase she is definitely much more settled and happier but is still having a lot of pain. Sadly, poor Pops has lost her hearing and is now profoundly deaf. She now wears hearing aids on both ears and this has affected her (and us as a family) hugely. Her behaviour can be difficult along with not being able to communicate well. It has been tough all round as it was very sudden but for poor Pops is must be so hard. She was very withdrawn but seems to be getting used to it now and we now need to learn to sign too. Life is still pretty much on hold until she gets her call and a chance at life. She’s not been to school since the beginning of reception class (she would be Year 3 this September) and it’s so sad she’s missing out on all the primary years. She’s still crazy as ever though and has acquired a ‘Disney channel’ attitude to boot, bless her. It’s amusing when she’s so teeny… you forget she’s 8 this year! Poppy and Coral are loving the loom band craze… It keeps them busy, though it’s mainly Coral! Coral is doing fantastic in school and has done amazing with her reading and is way above her age, she’s a star! Poppy still enjoys her colouring in and anything pink! Wow it has been a long time since we updated. Poppy is listed for a small bowel and pancreas transplant and we have spent nearly all year in hospital. Things just got worse and everything we have tried just made things worse. We really tried to get her gut feeding but she just can’t, bless her. She’s had 5 picu stays this past year where shes literally fought to stay with us. One of her worst was the encephalitis through which she sustained a brain injury with damage to a large area. She really did amazing and way better than her picu doctors thought she would, but it has left her with a left sided weakness, seizures, obsessive behaviour and needing splints on both legs, but she’s still a star! The ongoing pancreatitis is awful for her as she’s in a lot of pain which we are trying to control with a morphine patch plus added morphine and it does get her down at times. She gets very fed up but Pops being Pops, she is still as crazy as ever and still laughs like mad at silly things! Coral has had a tough year and big changes for her due to Pops care being so much at home now with lots of iv drugs all day. She has so little time with me and we don’t get out or do fun stuff anymore, so she’s missing out a lot. However, she is doing brilliantly at school and is so helpful at home – I couldn’t manage without my little sidekick! We just pray Pops gets her transplant call soon and she gets the princess life she deserves. I feel 2014 has to be better. Thank you to everyone who sends post to both girls, it means a lot and cheers Pops up lots. We love our Post Pals family! Thank you Bev Higgins for the advents, what a fantastic idea! Poppy loves it, she can’t eat or drink so this cheers her up loads! Poppy is awake and off the vent and most importantly is still herself. The neuro team are astounded by how bad her MRI is and how well she has pulled through!! What a star Pops is!!!! Literally improving by the hour, managing to do more and more things, as her brain creates new pathways. Go pops!!!!! Can honestly say we really truly are so lucky, she had amazing treatment in picu which all helped her and we are so so greatful and lucky to still have our girl. Poppy has had an up and down time and after a stay at Kings it has been decided that Poppy will be listed for transplant. They were waiting for test results to decide which organs she needs in addition to a new bowel. However, this week, Poppy took a turn for the worse yet again and was admitted to Manchester PICU and placed on a ventilator, as amongst other things she is having uncontrolled seizures. Today came the very bad news that Poppy has a large area of her brain that is swollen and damaged, both from birth and now from this. The doctors need to keep her resting in PICU to let the swelling reduce before they can wake her to see how the damage has affected her. All we can do is hope and pray that Pops is still Pops when she wakes up and that we can control these seizures. Poppy has lost at least 6 litres of fluid and is looking much more like her normal self. She is now breathing by herself (but on O2) and back on the main ward. Today she said a couple of words for the first time, this latest PICU stay has taken its toll on her. Pops had a stable night, she has a high temperature again though and her liver is very big and her liver bloods are not good. The frusimide infusion and restricted fluids (1.4mls an hour of tpn!!) have helped as she has lost a lot of the fluid she had on her. She is amazing, bless her. Last night Poppy was flown down to Great Ormond Street and spent the night in theatre. Pops is stable today, but had a bit of a scare this morning as she needed bagging. Her chest isn’t good and she will be vented for another 3-4 days but I’m hoping she proves them wrong. She is on very restricted fluid due to her retention as she is so swollen, bless her. Bear hugger keeping her warm as she can’t regulate her temperature. They are doing a lot of juggling with her bloods to keep her stable. Amazing how much work these PICU nurses put into keeping her going. Fingers crossed she remains stable. Poppy has been moved to ICU in Manchester to be ventilated as she is really not well, needs a chest drain put into her chest to drain her right lung, and the heart stents caused a superior vena cava obstruction as well as infection, causing her head to be hugely swollen. She is struggling bless her and is just so poorly. Poppy has been admitted to GOSH and will be having surgery to remove her colon. We are hoping she might be able to be discharged by the summer but it will be a long stay away from home and Coral. It has been a long time since i have updated and a lot has changed, but sadly not for the better. In the last 6 months Poppy has deteriorated a lot. Not only is she tpn dependent but she is now dependent on IV fluids day and night too, meaning she is connected intravenously 24 hours a day. She’s pretty fed up with it all. She got a line infection after a bowel procedure in April and things have just gone from bad to worse. She has had horrendous pain and she’s now on a range of pain medicines including nerve meds, morphine and codeine. She had to have emergency surgery in Manchester children’s hospital in August due to a prolapsing bowel which ended up with her being in HDU. She then got septic and had to have her hickman line (which she gets her nutrition and her fluids through etc) removed due to the infection and how sick she was. She went to theatre and had a central line put in, but due to poor access she ended up with a line in her foot, which was very uncomfortable due to the vein being very inflamed. Her bowel in the last 6 months has massively deteriorated and was so dilated and distended she was unable to sit, and was needing oxygen at times due to the pressure it was putting on her lungs and diaphragm. She couldn’t even sit up, and tests showed her small bowel had deteriorated and wasn’t working and flowing backwards into her stomach. So, she had more bowel surgery to form a ileostomy (this is a stoma) to help relieve the pressure. This operation went a little wrong, meaning a day later she had to go back to theatre again to be reopened and have the stoma moved. They also had to sort out a mass of adhesions. Poor girl, by now she’d had enough and ended up in HDU in GOSH this time. Once again, she was septic after surgery and ended up needing oxygen and was poorly and I was living on a knifes edge not knowing what was next. It had been an awful few months previous to the surgeries, she had barely been to school since April, and when she did she needed morphine administered in school to help her pain. She arrived home from GOSH on September 3rd, just in time for me to take Coral for her first day of school. Poor little Coral, she had been shuffled from pillow to post all summer. Poppy still wasn’t at all right, and was still on iv antibiotics and iv antifungals – then a week after these finished she took a turn again. She was so poorly this time she ended up in PICU in Alderhay hospital. It was a very stressful time and brought back many memories for me losing my son Oliver in the same way. Lately, all her organs are under a great strain, so she’s retaining fluid massively, she has very high blood pressure despite meds, her heart rates racing all the time, her nervous system has become affected and she has shakes\tremors, she’s so swollen and puffy due to the fluid shifts, and this infection just overwhelmed her very quickly and she went in to septic shock very quickly. Its always a TPN mums biggest fear and we were living it. Luckily, Pops is a fighter and she came through, she had amazing care and we owe our local consultant her life for getting her onto isotropes and ventilated and transfered so quickly. Since her bowel and general deterioration means she now can’t attend school, she’s pretty fed up. She’s been crying a lot and is very sad about things. Being connected to ivs 24 hours a day means no more swimming, which she loves to do, and in general we don’t really do much as a family anymore. She tires very easy and generally just feels unwell. The plan for now is that she has been referred to Birmingham children’s hospital for bowel transplant assessment. We really don’t know how we feel about it, but the negativity about where we are at right now from everyone makes us feel like we have no where else to go. It is just very scary. We are currently waiting to hear if they are going to remove her colon too, as this is a great source of pain. She’s needing lot of pain relief and is having to be on so many strong immuno suppressions etc, to try to help her inflammation, plus she now has enemas which she hates. I just really feel for Pops in all this. On a good note, Coral is really enjoying school, and is doing very well and is very bright – yay, go Coral!! Poppy is to start home tutoring after half term, so that will keep her busy, and hopefully it will be fun learning too. She’s getting very good on the laptop and is enjoying cbeebies, and now is a huge fan of moshi monsters – she tries to play online but it is quite hard, so i have to help and read it to her – she has a pink moshi online… always pink, still. We have a new amazing OT who has got her a new big comfy armchair for home which reclines and she spends most of her day in this and loves it. I would love one too! It reclines and is amazing! We have tried her in a fab new wheelchair too, which we find out on the 7th November if we get the funding for it. We really hope so as Poppy’s really looking forward to having a chair the same as her beloved Post Pal ‘Dominic B’… so watch this space! Thank you to everyone who sends post and just thinks of us at our tough times. Post Pals is always a godsend when Poppy’s poorly and stuck in hospital and is for Coral too. To know people remember her too is great as siblings are often forgotten. Particular thank you to Emma (Isle of Man) and Nathalia. Thank you for the personalised stickers too as both girls loved them! Poppy’s doing ok on this new Ivig treatment, she seems to have a little more energy, and has been off iv antibiotics now since the end of March when she had aseptic meningitis and pseudomonas line sepsis. She’s been having lots of problems with her left ankle, it’s very stiff and painful, especially in the mornings, so she’s just got to exercise through it while we wait for X-ray and scan results, and wait for a podiatry/orthotic appointment as the left leg isn’t growing and is much shorter than the right. Poppy starts big school in September and she got the school we wanted for her and they have been fab. Thank you to everyone who sent Poppy and Coral Easter craft sets, they had great fun making things. They loved the tiny little pram and dolly that Libby sent coral too, she plays with it every day. Post Pals is just fab, the girls love the postman now. Poppy is in hospital as she turned blue/grey tonight. February was not a bad month in all. Poppy had two chest infections needing iv antibiotics, but luckily we can do them at home. She was having masses of pain from her bowel so is now on new meds and they seem to be doing something but not fully working yet. Poppy had her educational psychologist assessment ready for school to see what help she’ll need for school in September. We had a lovely weekend away just local to us in our caravan, but the weather was terrible and Coral fell face first in the mud. Poppy found this very amusing, bless her! The great news is that Poppy has finally got funding for her IVIG treatment. GOSH are paying on a trial basis. We are very hopeful that this will help her immensely in the long run, and even a possibility it may help enough to get back onto tube feeds. Keep everything crossed please! Thank you for Poppy’s letters from Rachel and Adam, Mandie and Rosie, Emma, Sarah G, and lots more. Poppy loved her build a bear outfit too, very cute! Thank you. As usual, you guys do a fab job and always manage to bring a smile on the most hardest of days. It means the earth, thank you. 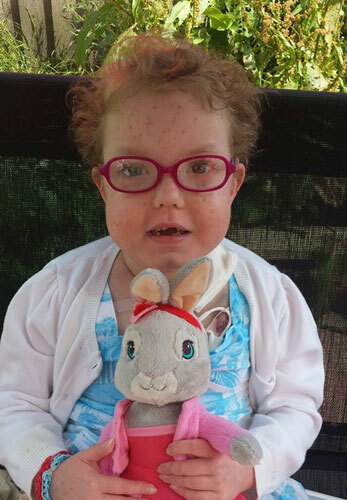 Poppy was in GOSH for an overnight TPN MOT on Monday and started her new treatment. Unfortunately she reacted to it and had aseptic meningitis and a bacterial sepsis. She’s on IV antibiotics and hopefully going home later this evening – as we do all her care we can manage her at home. Fingers crossed this treatment helps things but we are a bit worried about the next dose, although she will be pre-medicated this time. Well it’s been an up and down winter for Poppy this year. She has pretty much been on IV antibiotics the whole winter. In December she was very unwell and they were talking about PICU, but miraculously, with a lot of iv’s and blood transfusion she picked up. She was in a lot of pain and needed morphine, her mouth was full of ulcers and very sore, and it was so upsetting. New Year she had flu, so it was more ivs, oxygen etc, and home on ivs. Her gut in that time was terrible causing proctitus flares. The winter has been bad due to her bloods not being good, her bone marrow very suppressed and neutropenia, meaning for 8 weeks we were housebound, even over Christmas. At the moment Pops is ok, no infections and no ivs. Her gut is up and down and we’re trying to combat dehydration at the moment but she’s not happy about being connected to either or another machine all day. Sorry for the slow update but we’ve moved house and had no Internet! Thank you to Sarah Marshall for the lovely elf box for Coral – she loved all the princess things, especially the dolly and she shared her box with Poppy too. Thank you Post Pals for the girls’ balloons! Poppy’s going to have her deflated Minnie mounted on her wall. Thank you Jenny for the stickers. The smile box from Germany was fab and they shared it all! Viks and Kate, thank you for the tea set as the girls love crafting and they play with the tea set all the time! I’m hoping I’ve not missed anyone but the internet has been off and I’m trying to catch up! Post Pals is amazing and a whole new world for Poppy. Life for her can be strange living in Coral’s shoes, as in it is Coral’s nursery and Coral’s friends, Coral can eat and drink etc, but when she gets post sent to her from what she says are her friends, it really does light up her face with a smile. Thank you! Poppy’s blood works are not good at the moment, her bone marrow is very suppressed, her liver is struggling at the moment, and she’s anaemic so it is making her feel up and down and very tired. They’ve stopped her immunosupression for a week and then they’ll reduce the dose to see if this helps, but it will possibly have an adverse effect on her gut. She’s not allowed out at the moment or to nursery etc, as infection risk is very high. We’re going to Disneyland Paris on the 23rd of this month, but we need Poppy well to be able to go. Her bloods need to be better or we won’t be going, but she’s still smiling, bless her. Thank you Alison for the Halloween gifts and they also loved the flannels! Thanks to Post Pals for the Halloween bag too. Poppy has been up and down recently. She’s home which is fab and with home TPN we are having much more time at home now. We’re still having lots of problems with bacterial overgrowth and diarrhoea and pain , she’s just finished yet another course of antibiotics. She has seen her immunologist at GOSH and they want her to try immunoglobulin therapy IV (IVIG). They’re hoping this will help her immune system and her inflammatory problem. It’s a 5 hour infusion every 3 weeks at GOSH and after 3 tries we can do this at home as we’re IV trained. So fingers crossed!! We’ve had a lot of change of medication lately to try and help her gut, but not much change yet. Poppy is happy though and is now in nursery and enjoying it a lot! She’s also doing gymnastics too as it all helps with her physio programme; she finds it very tough and is exhausted after but is enjoying it. We are going on holiday to Disneyland Paris in just 4 weeks time. As you know, Poppy is a massive Minnie Mouse fan, so she is extremely excited! Thank you so much to Viks and Kate and all the Post Pals gang for running Post Pals. Poppy loves it! Thank you for Rosie and Mandy for Poppy’s gifts; I’m subjected to Mickey Mouse DVD all day now! Thank you to everyone who sends Pops cards and pictures and thanks Emma Stone for the pictures of badger. Thanks also to Dottie the Dalmatian – Poppy loves your adventure post! Thank you so much for Poppy’s DVD player as well, it is literally a life saver. She is in bed by 5pm most days exhausted and loves to watch her DVDs. Poppy is currently in our local hospital in Blackpool with a line sepsis. Consultants are all very worried as her immune system is very poor at the moment and she’s not responding as she should. Her body’s not responding outwardly with the infection which is worse, so we’re hoping these new antibiotics kick in and that she improves. Thank you all so much for your post as it really does cheer her up! Poppy is home at last after 7 months in GOSH on TPN. She’s doing ok at home, but still having a lot of pain, her bowels are not good, and she is still losing weight despite being on TPN. She is pretty worn out, bless her, but very happy to be home. The bowel MRI is on 26th July at GOSH. Thank you for Poppy’s cards this month. Viks sent a lovely hand made one, Emma Stone, lovely cards from the USA too. Poppy and Coral are very lucky girls! Also, thank you so much Post Pals as the girls had a huge parcel and loved their chair! They coloured the bean bag dogs in straight away too. Granny Ruth sent Poppy a Charlie and Lola magazine which she loves, she’s really into her magazines and books! Thank you to Louise for the Peppa Pig bags, Poppy now carries her feed pump in her one! Thank you to Alison L, she’s great! Thanks to Steph, Poppy loves her pink poodle. To everyone else who has sent post, thank you! Post Pals is brill and has brought a new life to Poppy! She’s not really got any friends because she’s too poorly for nursery and is always in hospital, but now she has lots of friends who send her post and it has really brought a huge smile to her face when the postman knocks! So thank you! The girls got their Post Pals parcel today and it was very unexpected! Thank you! They were so excited, giggling like mad! Apparently it’s a magic chair, it walks! The wind blew it along in the garden and they were wetting themselves with laughter! Brill! Definitely a much needed smile as Pops has been in a lot of pain again today. Thank you! Hey all! We are home! Poppy is all connected to the TPN too. Thank you all so much for the post you’ve sent Poppy and Coral! They just love receiving it. We had just arrived home tonight after a long journey (screaming, tired, bored, sore etc) and Poppy was grumpy and in pain, but it soon livened her up to come home to post!! We’ve decided to keep a notebook of addresses starting from now on so Poppy can write back, as she’s in bed early now at home because of the TPN and it’ll give her something to do. She’s had so much post it is hard to keep up!! Loads of love and thanks! You’re amazing people! Well Pops is definitely on the mend; our doctor just said she’s a very lucky little girl to pull through. She was very very sick – 10 days she was fighting it and she’s very worn out. I feel so relived an grateful she’s still here! Nothing will stop me smiling! Now it’s just a long recovery. Yet another bad night. PICU doctors wanted to do a CT scan over night as her head is swollen and morphine’s not touching the pain in her head and she can’t move. They reduced all her fluids because she’s so swollen, bless her. Just waiting for doctors now to see what’s next. MRI and echo and possibly CT scan needs doing. Poor little thing. We’re waiting on big news today for her. I will update when I know anything. I’m so tired it’s unbelievable! Little improvement today, but don’t want to count my chickens as when ever we have a sigh of relief that maybe she’s turning a corner, it goes wrong again.